This gave me a laugh at times! Thought I'd have a look since it was from you Shoorn........and had to watch it all. Funny, clever and probably honest.........and I'll be looking for the GREEN bracket next time I see one. 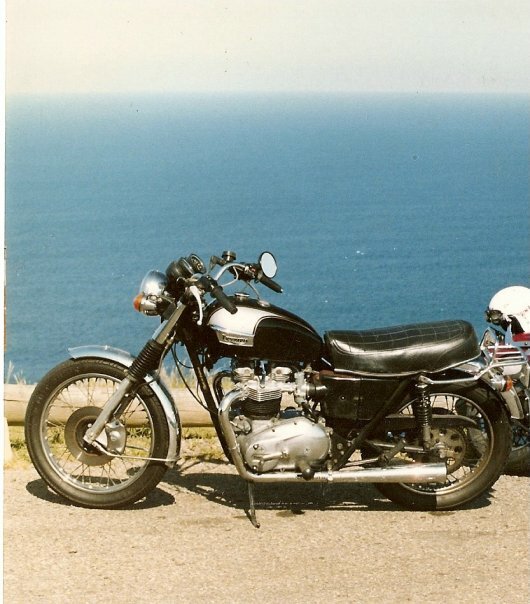 Yes, I owned a new '73 Triumph Bonneville Spitfire 750. 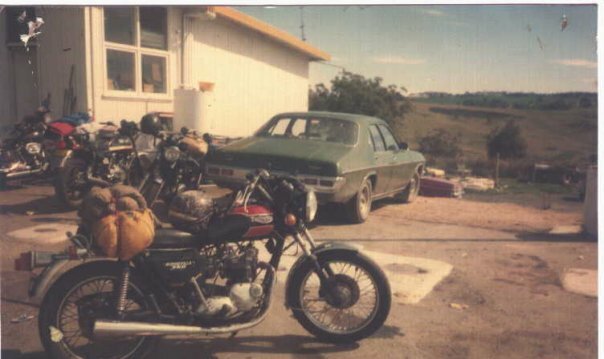 First year for the 750, oil running through the frame, front disc brakes, tall sissy bar. I rode it with fringe leather jacket and white helmet with red and blue stripes in the form of a British flag. My first big bike. Handled like a dream. But, most unreliable. Lucas electrics. Problems with pistons, etc. Couldn't sell it fast enough. My next bike was a '75 BMW R90, classic black, with Vetter faring and black mags. A real beauty. It was stolen. Always fancied a SR500; thought it would be fun around Cadwell Park and not leak as much oil as my cammy Norton! I've finally had a squiz at this. Wasn't "nearly pissed meself" funny, but pretty good. Loved the flashes of brilliance in his choice of photos. Like The Simpsons and other cartoons intended for adults. "Made in Thailand, not in Britain"...A mob of Indians (with a dot, not a feather) squatting in a car park. Don't blink or you'll miss some of them. Thanks for that. 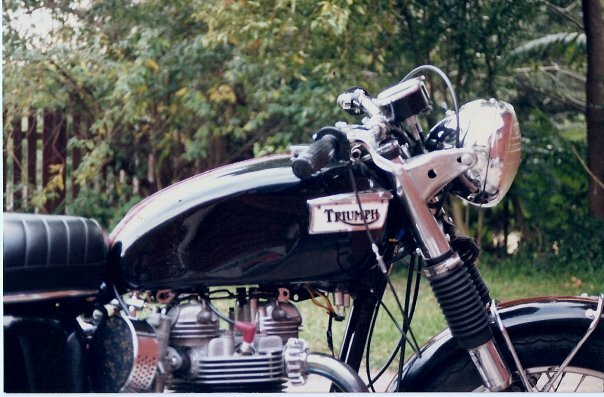 Found it amusing, I like the look "but" I have mates who have had terrible customer relations with Triumph and for me I dont want a Taiwanese bike, I had many moons ago a T140 and a T120V a 650 oil in frame, the 650 for me was the better bike Okay the brakes drums were not as good but after I had rewired it myself it was a reliable machine untill after many years the frame cracked [oil in frame] and lubricated my back wheel, still like em though. 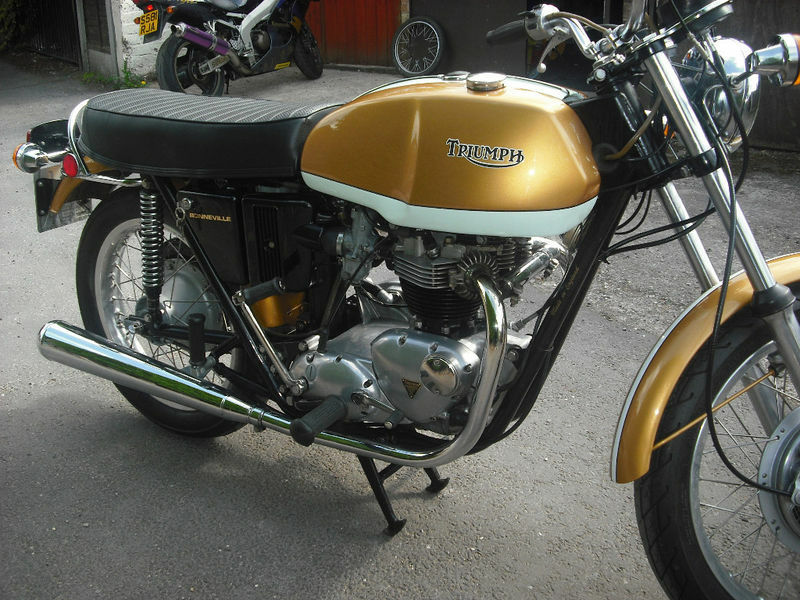 Gotta stick up for Triumph though - sure they assemble bikes in Thailand (and the UK). So what? Most successful vehicle manufacturers expand and serve global markets from different hubs; makes economic sense. It's still a British company to be proud of, and one that makes motorcycles successfully - God knows there are precious few of either. I think the old Bonnies were just great. 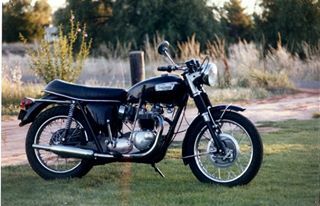 I started off with a TRW, then with a Speed Twin and eventually had an OIF-Bonnie. It was great fun racing Honda Fours on the small countryside lanes. It took me to the North Cape a couple of times and even more often to Rovaniemi where I had a friend with nice pectoral fins. It was my regular transport to Coalville in England and I travelled the Emarald Isle on it not only once. Okay, they needed a bit of care and attention but so did I - still do, in fact. @Mick Bogtrotter wrote: I think the old Bonnies were just great. 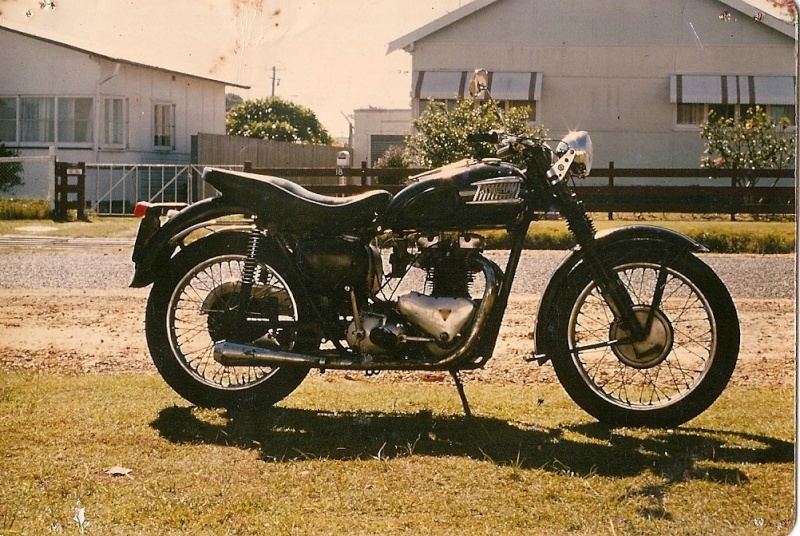 I started off with a TRW, then with a Speed Twin and eventually had an OIF-Bonnie. It was great fun racing Honda Fours on the small countryside lanes. It took me to the North Cape a couple of times and even more often to Rovaniemi where I had a friend with nice pectoral fins. It was my regular transport to Coalville in England and I travelled the Emarald Isle on it not only once. Okay, they needed a bit of care and attention but so did I - still do, in fact. This post made me smile and made me wonder was I on one of those Honda 4s in the Emerald Isle. More than once I enjoyed curvy roads on a CB500-4 but on two occasions, while the Honda was certainly a match in terms of handling there was a reliability issue but not on the Honda. One was a Triumph 650 which disintegrated at something over 110, fortunately from behind, the other was a Triumph TR6 Pi straight 6 car which on a dual carriageway slowly edging past with a slightly higher top speed, when there was a bang and a cloud of blue smoke.....ouch. I stopped out of sympathy as he had been trying to impress his female passenger....I still reckon the Triumphs would have survived if they did not have the reliability issues. Drilling and cutting the cooling fins in order to stop the barrels from getting barrel-shaped was one of the tricks. One of the guys playing tricks on the old Trumpets and especially the Nortons is James Rodney Smith, the former head of RJ-Motorcycles in Coalville, Leics., England, another one is my Dad, a Matchless Enthusiast par excellence. I'm a Trumpy man from way back....Still have a soft spot for them. My first " big" bike was a 58 Tbird. Then I had a collection of Bonnies...dry and oily framed ones. Love 'em all really! ALso had a MkIII Interstate, which is still in the family and belongs to my nephew. Ah, so that's what happened. Your leg vibrated off! It developed a leak I couldn't fix!